Free landscape design examples of professional gardens are available to download. We have landscaped adaptations of our show gardens for satisfied clients. Copy and adapt a free landscape design to suit your garden. Visit our garden plans page for an overview of the complete range of downloadable garden designs, or learn how to do your own garden design. The style of the house is Moorish. The interior of the house and colors of the walls have been color coded. The garden is a continuation of the house. It creates a feeling of being in when you are outside, and of being out when inside. The existing garden was cleared out to make space for this garden. Oh yes, one last thing before we get to the plan. All the gardens on our website, including this free landscape design, may be copied free for your use, in your home garden. You may not use any of our designs or parts thereof, for any commercial purposes. I’m sure you understand! Get your MASSIVE 50% Discount Now! A brand new Zen Garden Design has been added to our portfolio. It complements our other three top designs, a Mediterranean Garden Design, a Tropical Garden Plan, and a Japanese Garden Design. The family that occupies this home has children. They often have friends over. Large turf areas were planted to accommodate their needs. The pond areas are child safe. I called the name of this garden Pumpernickles Picnic Garden. It is utilized by a fun loving family. The large bold curves add unity, harmony and the right flow to the garden. The shape of the paving, swimming pool, pond and bold curves of the garden all link together. There are sufficient focal points to stimulate visual interest. Fresh healthful living is provided by the all season herb and vegetable garden. A bridge on a winding curved path is an interesting feature of this landscape design. It adds more interest as the path leads to a silver birch forest. Fairy Primrose and different shades of lavender are planted in between the trees in the forest. A bench provides the human element in the forest. Additional benches are located in various other parts of the garden. The garden is divided into different sectors (known as rooms). The whole garden is thus not seen at the same time. It provides the visitor with surprises and a form of anticipation and excitement as she wanders through the garden. Patterns have been made with the different plant materials. They have been grouped into the required water zoning areas. Patterns have also been repeated to create rhythm, harmony and visual unity. Download the complete free landscape design and plant list . Note the picture file size is 194 kB and may require some time to download. Right click on the link and "select save as.." and save to your PC. Select a suitable image viewer to view the picture. 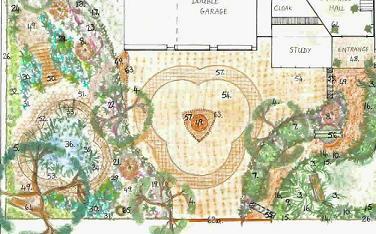 Return from Free Landscape Design to Garden Plans.